Travelling by boat in London may seem a slightly ususual way of getting around, but it is – perhaps not surprisingly – actually very pleasant, and certainly recommended as a nice way of experiencing the River Thames. The only downside, unfortunately, is that boat journeys tend to be quite pricey, so we would advise using boat transport sparingly. To really get your money’s worth, try taking the longest route on the Thames. Routes for travelling by boat on The Thames include from Westminster or Embankment to Greenwich (technically Woolwich Arsenal – this is the longest route), Westminster to Chelsea, Wandsworth and Putney, and Bankside to Millbank (between the two Tate Galleries). Full details of routes, timetables and fares can be found on the Transport for London River page. As we’ve said, tickets for the boat services can be pricey and are more expensive than the Underground. Fares cost £1.70 (for some of the really short journeys) right up to £9.50 for a single ticket, depending on the route. Oyster pay-as-you-go cards are now accepted on some routes and if you do use one, you’ll get a 10% saving on the ticket price. 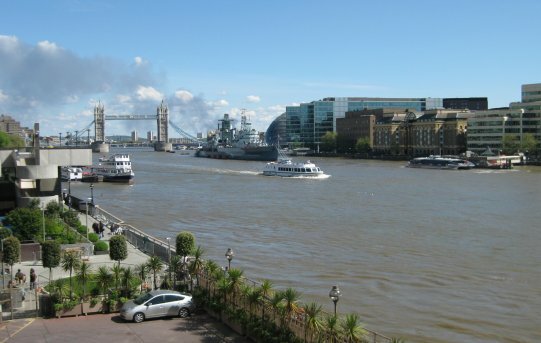 There is also a “River Cruise” experience which might work best for visitors to the city in terms of what you can see and experience – see details on the TFL page above. For a more special experience, you might also like to try one of the lunch or dinner river cruises, which include three/four-course meals and entertainment!